I’ll be doing a blog post all about the buying process and some interior updates in the near future. But for now, I am living from boxes and trying to make little corners feel more homely, whilst I wait for the decorating to be done. To be fair, the house isn’t in bad condition. It’s just flooring I want redoing and some wallpaper/general decorating to tick off the list. So I’m trying to keep as much as I can in boxes within the rooms that need things doing! In the interim, I am making the key places feel a little more settled and adding small additions to these spaces to feel a bit more relaxed about it. The perfect starting point to make any space feel more homely is candles and fleecy blankets. Familiar or seasonal scents really do help you to escape from the bare plaster walls and half finished living room. If you’re on a budget (after spending a million quid moving) then you’ll want to check out TJ Hughes. I picked up these Yankee Candles(!) and fleecy blanket for under £30. They have so many home accessories and I didn’t even realise! 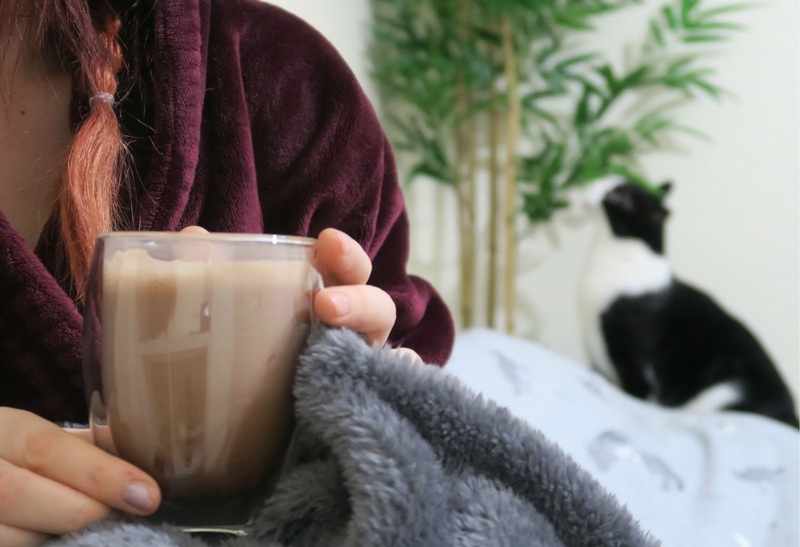 The scents are perfect for Autumn and I cannot believe how soft and big this blanket is for the price! For only £14.99 the only downside is that the cats want to steal it from me. Another way I’ve found to ensure that my house feels as much like home as possible, is to ensure my beloved coffee machine was one of the first things I unpacked. I’ve had a coffee machine for years now and honestly, it just doesn’t feel right not having one! Living alone it’s just a pain to have milk in, as it always goes off before I manage to drink it. Coffee pods solve this issue by having a long shelf life… Not like they ever last me longer than a few weeks when I drink so much coffee. I also recently discovered that you can get Nesquick Hot Chocolate for the Dolce Gusto Machines from The Coffee Mate*! The perfect way to wind down an evening, in this fancy latte glass I got from there too. These double wall latte glasses have always intrigued me, so I’m glad I finally have one! Now I’ve got some essentials around me to add a little calm to the storm, I can also start upping my blog posts again and showing some more interior blog posts. I really can’t wait to unpack properly and settle in. Previous Post Collaboration: How Early is too Early for Christmas Shopping? Next Post Beauty Blog: Are Dermacol Products Any Good and Can it Cover Tattoos?